> argument? That’s been done already. Alas, that's news to me. > anything wrong with the numerals. Mr Stower - we know you well enough on this Board to know that if you COULD present such an ordinal number on its side (that is NOT a day of the month) as evidence in support of your claim, you WOULD present it. Of that there is little doubt. That you DON'T present such evidence speaks volumes. > numerals are normal has been established. It has been established ONLY as normal for days of the month (hence why I originally suggested in our earlier exchange that the numbers on these blocks were days of the month). > that it goes up to “eleventh” and beyond. No, it is far from clear what Gardiner's "etc" means. Gardiner's passage is highly ambiguous. 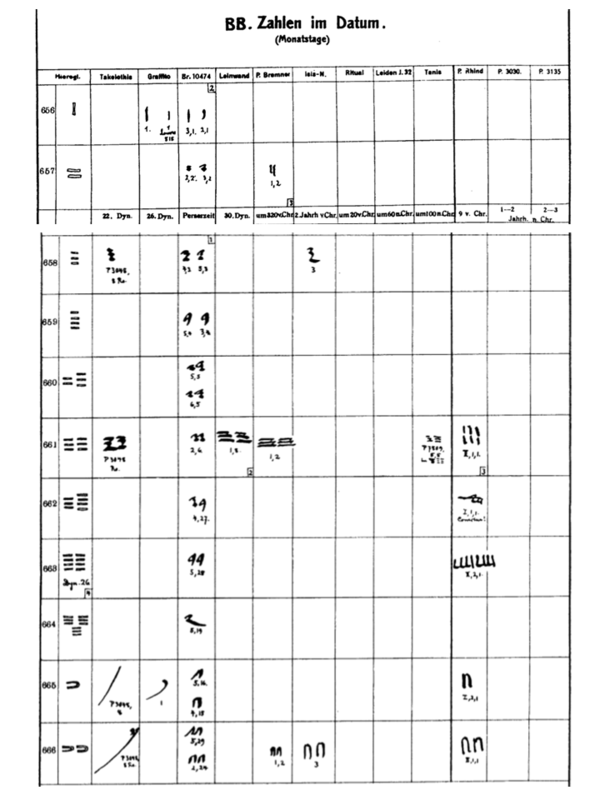 He clearly states "In hieratic the tens and units, when referring to the days of the month, are ivariably laid on their side..." He then goes on to give some examples. He then goes on to talk about similar uses but for UNITS ONLY in hieroglyphs from the Middle Kingdom. He then talks about the "horizontal position" (of what, the units only?) becoming associated with more ordinal than cardinal. He then finishes by saying, "...in hieratic texts [from when, the "Middle Kingdom"?] this position is apt to be found in the words for 'third', 'fourth' etc" Again, is he talking still about UNITS ONLY? It is not clear because Gardiner gives no examples above 9 where we would then see exactly his meaning. Hence why I have asked for you (or anyone else) to present such an example (that is NOT a day of the month). You cannot present the disputed numbers from these chambers as examples of your argument. That's nonsense. The fact of the matter is, thus far, the ONLY examples (that apparently are not dates) of the number 10 ('n') being placed on its side exists only in the chambers blasted open by Vyse. Funny that. As in 'funny - peculiar'. > and not rotated by me. Yes - see Moeller above. My so-called "arbitrary stipulations" are formed from looking at the available evidence. All I ask is that we see somewhere outside the Vyse Chambers an ordinal 'n' on its side (that is clearly NOT a date) and which is contemporary with the early Old Kingdom period. There must be an abundance of such examples - I looked but couldn't find any. Finding just one clear, unambiguous example (that is NOT a day of the month) can't be too much to ask for, now can it? Edited 4 time(s). Last edit at 13-Feb-18 21:10 by Scott Creighton.